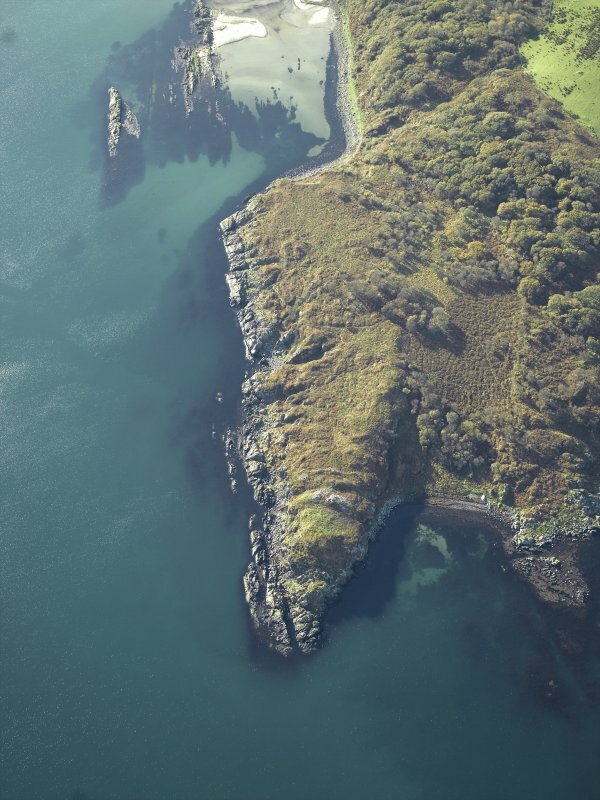 Oblique aerial view centred on the remains of Trudernish fort, Islay, taken from the NE. Oblique aerial view centred on the remains of the fort, taken from the E.
General oblique aerial view centred on the remains of the fort, taken from the NE. (East coast). 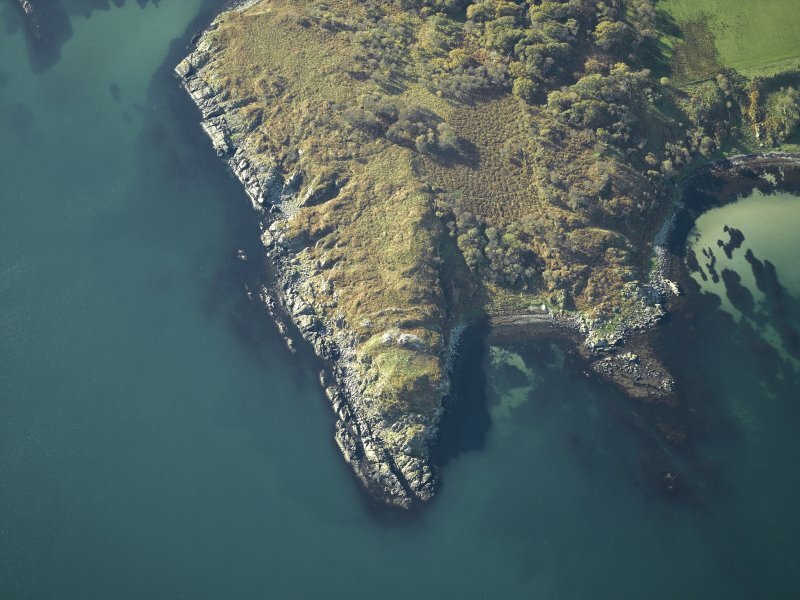 Dun, vitrified fort, Trudernish Point, just under 1 mile [1.6km] of Dun an Rubha Bhuidhe (NR45SE 6), and visible therefrom. The rocky promontory, about 30ft [9.1m] above the water’s edge, is cut off by a strong wall, now a mass of rubble in which several of the stones are partially fused and some form typical vitrified agglomerations. Outside this are two massive walls, double-faced with traces of good masonry in castle style. They are not strictly parallel to the vitrified rampart and may have been built on to it. In the case of this ‘castle’, the vitrified wall may be older than the typical castle masonry. (This is one of the five duns that are noted in 3½ miles [5.6km] of coast between the E spur of Beinn Bheigeir and the SE corner of the island). V G Childe 1935, no. 4. Shanks (1972) notes an irregular enclosure on the N side of Trudernish Point. It is bounded by the cliff edge on the N, by a 180ft long wall on E, and a 120ft long wall on W curving at S to close with the wall. This wall is 3ft to 6ft thick, bonded with outcrop. by 28.0m on the highest ground. Cliff on the NW and SE and slopes on the NE protect the sea-ward sides. The main wall is a tumbled mass of stone standing, from 2.0 to 3.0m high and spread from 4.0 to 6.0m broad, with a centrally placed entrance. Large masses of vitrifaction are exposed in the core material in three separate places. The Medieval wall, estimated width 2.5 to 3.0m, stands from 1.0 to 2.0m high and exhibits outer facing for much of its course. The entrance opposes the main wall entrance and packed stone between them suggests a causeway. The outermost wall, 1.0m high at best, survives as fragmentary outer facing backed by a rubble spread 1.0 to 2.0m broad; the northerly section of the wall has been incorporated in an early modern drystone wall. No entrance position identified. No "irregular enclosure" as specified by Shanks (1972) was located. Visited by OS (JM) 17 March 1979; Information from RCAHMS. Trudernish Point is the name given to the tip of the prominent headland that juts north-eastward between Claggain Bay to the N and Aros Bay to the S. The NE end and the two sides of the headland rise for the most part as cliffs up to 15m high, and the fort was constructed by drawing three stone walls across the neck of the promontory to cut off an area measuring about 30m by 25m; there is no evidence to suggest that the walls ever continued beyond their present limits. 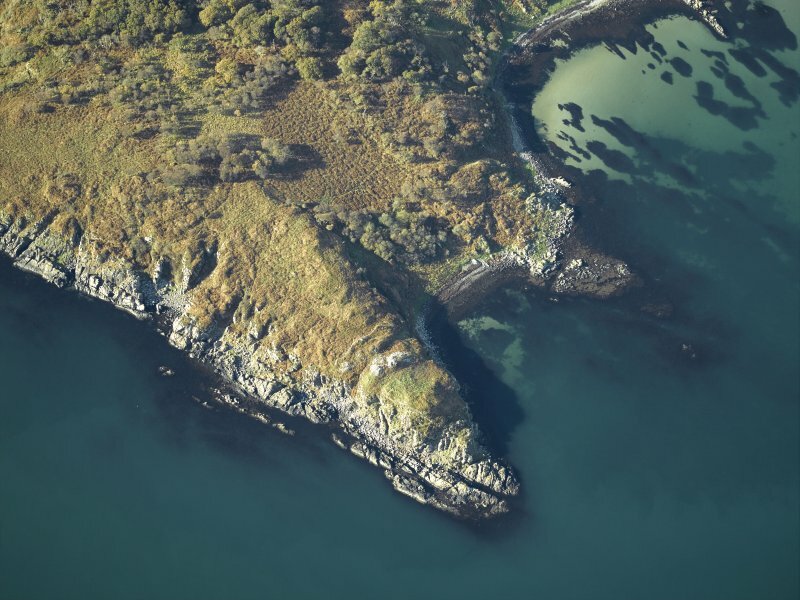 Together with Dun an Rubha Bhuidhe, Islay and Dun nan Gall, Islay, situated 1.5km and 3.2km farther N respectively, it forms an unusual group of three fortified sites in the area, all situated on coastal promontories and all bearing traces ofvitrifaction. The inner wall (A on RCAHMS plan [RCAHMS 1984]) is the most massive; no facing-stones are visible, but the rubble core still stands to a height of 2m internally and 3.2m externally. It has been subjected to intense heat, for at three points, where the lower levels of the core material are laid bare, small masses of vitrified rock have been exposed. Much of the rest of the rubble has been shattered and reddened by fire, but close to the edges of the cliffs, on the NW and SE, it has fallen away altogether, and some of the debris can be seen scattered on the shore below. The entrance was probably near the centre, where the weight of stone is much reduced. is 2m high internally and 1m high externally; no vitrifaction can be seen, but near the SE end the core material has been reddened by fire. rubble, have been incorporated in a drystone wall of no great age. The fort wall, which is I m in height, shows no sign of burning. RCAHMS 1984, visited June 1976. Visited by Childe in 1934. This small fortification occupies the headland known as Trudernish point. The irregular interior on the top of the promontory measures no more than 30m from NE to SW by a maximum of 25m transversely (0.07ha), and is defended on the SW by no less than three walls, the inner of which is massively vitrified and forms a bank of rubble up to 5m thick by 3.2m high externally and 2m internally. The middle wall is up to 2m thick, with long runs of massive outer facing-stones, while the outer is comparatively slight, comprising little more than two runs of outer face incorporated into a later stone dyke. Nothing is visible of the entrance, though RCAHMS investigators suggested that a dip in the crest of the inner wall roughly midway along its length might mark its position.